Come October 2012 the Gandhi’s Gunn name was retired and Isaak born, just in time for the band’s signing with Small Stone, which is now happy to announce the imminent global reissue of The Longer The Beard, The Harder The Sound, in March 2013. Newly expanded with four tracks (including covers of Pink Floyd’s “Fearless” and Iron Maiden’s “Wrathchild”), the album has also been remixed by Eric Hoegemeyer at Brooklyn, NY’s Tree Laboratory and mastered by Chris Goosman at Ann Arbor, MI’s Baseline Audio Labs. Recorded by Mattia Cominotto at Greenfog Studio – Genova, Italy. Mixed by Eric Hoegemeyer at Tree Laboratory – Brooklyn, NY. 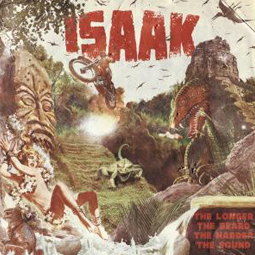 All songs by Isaak except: “Fearless” (David Gilmore, Roger Waters) and “Wrathchild” (Steve Harris).